So, as you may recall, if you don't count LiveJournal's welcome post, then the entry where I linked to the maze I made in The World's Biggest Pac-Man is my 666th LJ entry. ...Why would I like an image consisting solely of flames and the Number of the Beast? 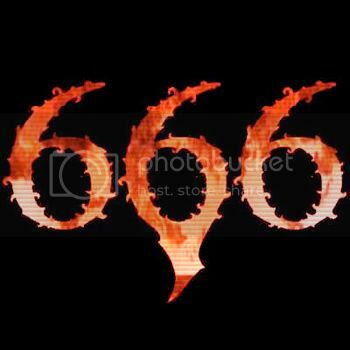 You seem to notice 666 whenever it crops up, so I thought it would make sense. I sent it at 8:50 PM in my time zone, which is probably 11:50 PM in yours, unless you're three hours and ten minutes ahead of me. Eh, I think it probably is 666, but I'm still open to the possibility that it could be 616. We'll have to wait until the Mark of the Beast actually starts being issued in order to know for sure. Why is midnight so scary? Oh, heh. I guess if you're extremely religious, that might freak you out. Midnight doesn't freak me out, usually - nor 666. Have you ever had to pay $6.66 for something? Or had change totaling $6.66? What do you do then? I don't consider myself extremely religious like those customers. I've never had to play $6.66 for anything, but if I did, I'd probably simply add or remove an item - I wouldn't scream, “I don’t want it! The devil’s already marching through the stores.” or “Your cashier is touched by Lucifer himself! She needs to be baptized in the holy waters.” or anything like that. Hahaha... good to know that you'd be rational about it. I don't remember having to pay that amount for something, or receiving that amount in change, but I do a bunch of shopping - probably not memorable enough.